K and I rented a DVD of old News Radio episodes. 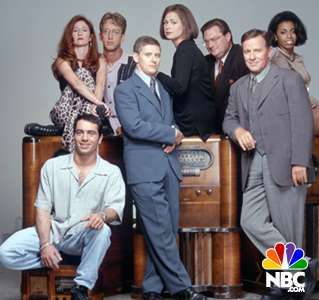 For those of you who don't know, it is a classic sitcom of the mid to late 90's. It is good t.v. In the meantime I know you all are wondering why there is no good television in April. It is because Sweeps start in May. Allow me to send this angry diatribe out into the blogosphere: O you television people! Why can you not just make good t.v. all the time? Why must you only show new episodes of LOST during sweeps! My fierce anger is kindled against you! Grrr! In closing allow me to say that there just is not much good t.v. anyway. Why, when I was a boy we had good t.v. But this newfangeld stuff is just no good. I agree wholeheartedly. All I ever hear about now is reality shows that are pretty lame. I saw part of one-deal or no deal and thought it was pretty stupid. Of course, I don't have tv so I'm not subjected to the whole thing anymore, although it would be nice to catch alias or one Lynn talks about called bones. Well. I am glad to know that someone watched the Daytime Emmy Awards. They put enough commercials on this year. Dawn-- Alias is about to end! So soon you won't have to worry about that one.